The Incorporated Society of Musicians (ISM), the professional body for the UK’s musicians has today, Tuesday 31 July 2018, published its Musicians and Brexit report which reveals the concerns of more than 1,600 musicians regarding freedom of movement post-Brexit. The unique study conducted in April 2018 builds on two previous surveys of musicians and uncovers musicians’ travel habits when working in Europe and the rest of the world. The report calls for freedom of movement to be protected for musicians post-Brexit. More than 40% of musicians have noticed an impact on their work as a result of Brexit. (Up from 26% in 2017 and 19% in 2016). More than one in eight performers had less than seven days’ notice between being offered work and having to take it. More than a third of musicians had experienced difficulties with visas when travelling outside the EU. In fact, of those experiencing difficulties 79% of those identified visas as the source of those difficulties. The purely financial cost is significant, and whilst employers and engagers often cover the visa costs, 33% of musicians still spent more than £300 a year on securing visas to work (5% of musicians spent more than £1,000 a year). But this is not just about the obvious financial costs: 15% of UK musicians have lost a job opportunity because of problems with visas. ‘The Government is making all the right noises at the moment and the EU White Paper recognised the importance of mobility for professional musicians and creatives who make up our £92 billion a year creative industries. ‘However, at a time of great uncertainty, musicians need to know their jobs in Europe will be secure once Britain leaves the EU. The ISM is the UK’s professional body for musicians and a nationally-recognised subject association for music. We were set up in 1882 to promote the art of music and to protect the interests and honour of all musicians. Today we support almost 9,000 members with unrivalled services and expert advice, from study up until retirement and beyond. We are a wholly independent, non-profit-making organisation. 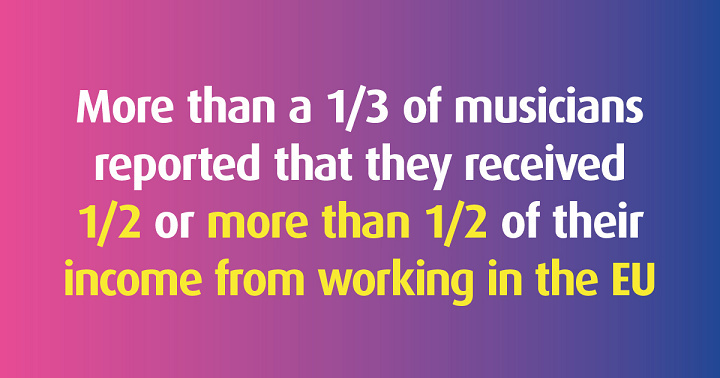 The Incorporated Society of Musicians surveyed 1,625 musicians over three years. FreeMoveCreate is a campaign to protect freedom of movement for the UK’s creative industries post-Brexit. The campaign is the home of 40 organisations from across the creative industries, encompassing tens of thousands of creatives, including musicians and artists from the memberships of founding organisations a-n The Artists Information Company (the UK’s largest artists’ membership organisation) and the Incorporated Society of Musicians (ISM – the UK’s professional body for musicians). We are calling for any transitional and permanent relationship with between the UK and EU to ensure that musicians, directors, technicians, designers, artists, dancers, sound engineers, actors and all the creative industries professionals can continue to travel to the EU for work.